This tutorial shows how to use the TR5 keypad as a coded switch in base type levels with the option of on screen instructions being given to the player. I have tested it and found it to work in switch slots 1 - 4. When adding it to your wad there is no need to use WadMergers switch manager; just copy the keypad into a switch slot. Also ensure you are using one of the revised wads. By default Lara will perform the small push switch animation when using the keypad, but this and the animation she does on exiting the keypad can be changed along with the sound the keypad emits when a button is pressed. The secret to its operation is the OCB code which takes this form 16384 + the desired 4 digit code number. For example if you want a user code of 1234 the OCB code for the keypad would be 17618. After placing the keypad and entering the correct OCB code, place a switch trigger beneath it as you would for a normal switch, along with the trigger for the object to be triggered. To give the player on screen instructions the two flipeffects shown below are used. The first sets size of the text and the second determines what is printed and how long it's displayed for. 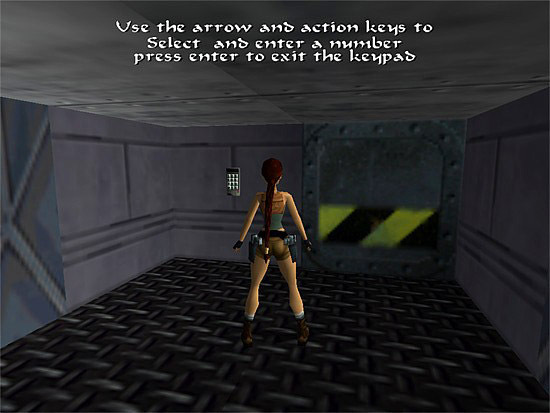 They should be arranged so that as Lara approaches the keypad they will be triggered in the order they are shown here. The text you want displayed must be added to the English.txt file as an additional string. This can be done manually but to avoid errors use the NGScripter as described in this tutorial. Either way the finished English.txt file will contain extra lines similar to these. 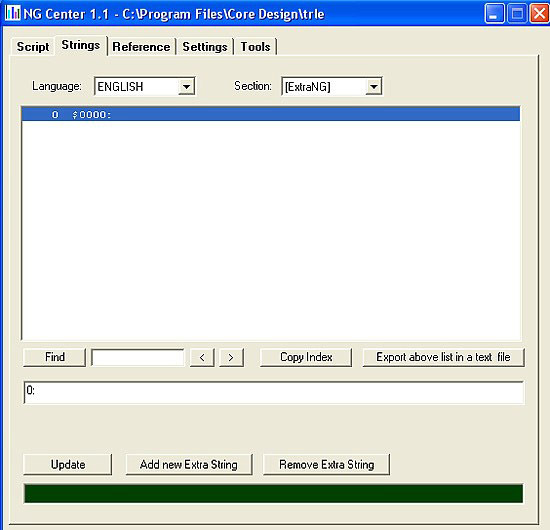 Open the NGScripter and from the Strings tab select the [ExtraNG] option from the section drop down box; then click the Add new Extra String button. A new entry will be started and the cursor will be positioned in the text box near the bottom of the window; this is where you will enter your text. Enter your text into the box at the bottom of the window, when you want to start a new line enter \n into the text. If you're using half height characters as I did try to limit each line of the on screen text to a maximum length of 32 characters. After entering your text, press the Update button to transfer it into the top window. Click on the script tab and find the level section of your script. You now need to set the colour, position on screen and the size of your printed text. This is the command I used to have white, size10 text at the top centre of the screen. To be used in the title or level sections of the script. A complete explanation of the arguments used with this command can be found under the Reference Tab of the NGScripter, in the Show SCRIPT NEW commands window. The values which can be used for all of these arguments can be found under the Reference Tab of the NGScripter, in the Show _ MNEMONIC CONSTANTS for new script command window.